Jindaiji Soba (深大寺蕎麦参道) is a popular Soba in Tokyo. 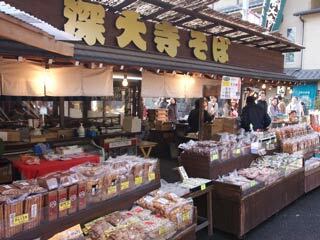 There are over 20 Soba restaurants around Jindaiji Temple. It's a great spot for all Soba Lovers. There are parking and restroom, but no ATM, and Cash Only. In Edo period, people payed their tax by rice. However, because this area was not good for growing rice, people here pay their tax to Shindaiji by Soba instead of rice. When the priest of Ueno Kaneji Temple visit Shindaiji, he was treated Shindaiji Soba. He really loved its Soba, and told all of his priest friends that Shindaiji has best Soba. Also, the 3rd Tokugawa Shogun Iemitsu loved this Soba, when he was enjoying Takagari.